The Elders met civil society groups, diplomats and members of the Irish government in Dublin last week to discuss the role of Europe in the Middle East, the prospects for young people in Northern Ireland and other issues relevant to their work. The Elders had lunch with the Tánaiste and Minister of Foreign Affairs Eamon Gilmore to inform him of their peace-building activities and hear about Ireland’s foreign policy priorities. They also had a meeting with President Michael D Higgins in the afternoon. Earlier, former Brazilian President Fernando Henrique Cardoso, former US President Jimmy Carter and former Irish President Mary Robinson, met privately with NGOs and European diplomats to explore Europe’s role in reviving the two-state solution and the Middle East peace process. 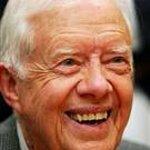 Jimmy Carter, who led an Elders’ delegation to the Middle East in October last year, said: "We had constructive discussions here in Dublin with the Irish Foreign Minister, European diplomats and civil society groups, all of whom are striving to protect prospects for a Palestinian state living side by side with Israel. “With the Middle East peace process making no significant progress, we call on Europe to play a stronger and more independent role in revitalising peace efforts, with a fresh approach. 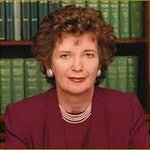 Mary Robinson added: "People throughout Europe, in their capacity as consumers, have the power to reignite hope in the Middle East. Several European countries are already labelling differently products from Israel and goods made in illegal settlements. As Israel’s largest trading partner, the EU could send a strong signal by introducing clear, EU-wide labelling guidelines. While in Dublin, the Elders also held a roundtable discussion with a group of young people from Northern Ireland. Although Northern Ireland is not a focus of their work as Elders, Martti Ahtisaari, former President of Finland, Ela Bhatt, founder of India’s Self-Employed Women’s Association (SEWA) and Gro Harlem Brundtland, former Prime Minister of Norway, wanted to listen to and amplify youth voices working towards reconciliation in Northern Ireland. Gro Harlem Brundtland, who chaired the roundtable, said: "Northern Ireland’s remarkable progress in the fifteen years since the Good Friday/Belfast Agreement is an inspiration to the world. “However, talking to young people who have grown up with the peace process showed us that a lot more needs to be done to build a truly inclusive society. They shared their disillusionment with a political system still dominated by sectarian interests. High levels of unemployment and continuing segregation leave young people in marginalised communities particularly vulnerable to violence and this is yet to be properly addressed. The Elders’ visit to Dublin follows an internal meeting of the organisation, in Ireland, to review their work programme and plan future activities.